Many women who trek over to NaturallyCurly for the first time as full-grown women are experiencing curly hair for the first times in their lives. These women come from the scary, and often empowering experience of breast cancer. Chemotherapy doesn't just have a tendency to steal your locks, but also your original hair texture. Even women who were naturally curly before chemo often experience chemo curls. Chemo curls refer to the change in texture from what your originally had to the type of curl that forms after chemotherapy. For some women, their natural texture eventually comes back. For others, not so much. In order to get an inside look at life through chemo hair loss and then regaining a different type of curl, I spoke with Shelley Barnes of Washington D.C. to learn and share her breast cancer hair story. Shelley was first diagnosed with breast cancer in July of 2008, when she was just 25 years old. The lump was removed by lumpectomy and 33 rounds of radiation without any additional chemotherapy, "which was good because I had a huge fear of losing my hair," explained Shelley. 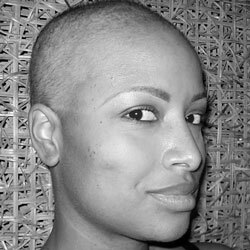 Shelley after shaving off her hair. In 2010, however, another lump was found in her other breast and doctors determined that chemotherapy was necessary as a measure to prevent yet another re-occurrence. "I was really afraid because everything you see on TV is so dramatic," said Shelley of her nervousness leading up to her four rounds of chemotherapy. After two rounds, her hair began to fall out around the hairline. With very thick, shoulder length hair that had been worn natural since 2003, Shelley became weary of even combing her hair because with every stroke, she would pull out 50 strands in one section. At first, she decided to just clip her hair short and wear wigs, but in 2010 she finally decided to just shave it all clean. "That was the scariest part," said Shelley, "Just seeing yourself totally bald." Shelley's hair has since grown back, and like many patients who undergo and recover from chemotherapy, her hair texture has drastically changed. "At first it started to grow back straight and I was afraid it wasn't going to be curly because I really love my curly hair," she explained. The texture is now smoother, silkier and darker. It holds moisture better and has a looser curl. Her first big lesson in caring for her new texture was that it cannot take as much heat as her pre-chemo hair. "I pressed my hair and afterwards noticed a lot of heat damage after using the same settings I used to use," explained Shelley. "After a few protein treatments my hair bounced back, but I now know that I can only use low settings when heat styling." 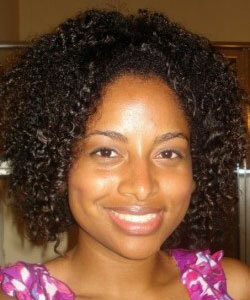 Shelley has also found that her product regimen had to be adjusted to her new chemo curls. "I can't do heavy butters or products any more because they weigh down my hair." Shelley's new products include SheaMoisture Coconut and Hibiscus Curl Enhancing Smoothie, Mixed Chicks Deep Conditioner and vitamin E oil on the scalp to stimulate growth. Are you, or is someone you know, experiencing chemo curls right now? Find out how to care for curly hair after chemo! Shelley's hair is now in a bob and she remains confident that it will all grow back. Her advice to others struggling with chemo curls: "It's hard to tell someone going through the process that it will grow, but I promise it will. It just takes time and patience." To learn more about Shelley's story, check out her blog The Frolicking Champion.